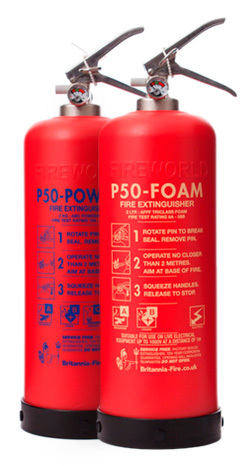 The P50 Fireworld self-maintenance fire extinguishers from Britannia are an important alternative to conventional extinguishers which require servicing when used in a business environment. 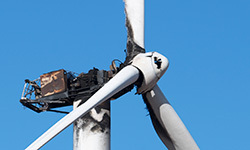 The potential cost savings of the self-maintenance alternative are substantial but some businesses are still a little unsure if they are simply allowed to make the change. After all, for decades, fire safety companies have preached about the importance of extinguisher servicing by servicing engineers. The P50 Fireworld extinguishers break with this tradition and for the first time an extinguisher does not require any servicing, or refill during the 10 year lifespan of the extinguisher. This change of maintenance regime was only possible by Britannia in Norfolk totally re-designing fire extinguishers. The new extinguishers are corrosion-proof, do not age and the extinguishing agent is guaranteed by the chemical manufacturer for 10 years. And, rest assured, the P50 extinguishers fulfill all legal requirements, are certified to BS EN 3 and are accepted by insurance groups. When a business purchases the P50 Fireworld extinguishers we will send out a service engineer to carry out a site survey to ensure you are fully covered. The engineer will also certifiy your extinguisher provision. He/she will train business representatives how to look after their extinguishers. And at the end the customer will also be handed a form to be sent to their insurance to inform the insurance about the changed maintenance regime. 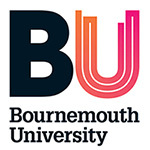 Whilst this is not strictly necessary we regard it as good practice to keep your insurance informed even though some insurances like the Ecclesiastical Insurance Group (the UK’s largest insurance group for the church sector) have already formally endorsed the product and do not require notification. The self-maintenance extinguishers have been successfully installed in many small and medium businesses, schools, supermarkets, ships and churches where they help to create savings, year after year.